Trying to download a software and there are two options available for 32-bit and 64-bit of the same software. Are you confused which version to works best with your Operating System version and download on your system. Lets understand the difference between the different versions. The terms 32-bit and 64-bit refer to how much of your computer’s memory (RAM) can be used by applications. While a 32-bit processor can access 232 memory addresses, a 64-bit processor can access 264 memory addresses. This is not twice as much as a 32-bit processor, but rather 232 times more!!! The 32-bit version can use up to 4GB of RAM, while the 64-bit version can use a maximum of 16 exabytes of RAM , which means 64 bit versions allow more memory accessibility than in the 32-bit version. What are the system requirements for the 64-bit versions? The 64-bit software versions require 64-bit version of Windows Vista, Windows 7 or Windows 8 on a PC, or Mac OS 10.5 or higher. Also minimum of 8GB RAM is recommended. Does the 64-bit version of performs better than the 32-bit version on a 64-bit operating system? There are no differences in CPU handling between the 32-bit and the 64-bit version to cater to the repetitive Out of Memory crashes when using the 32-bit version, the 64-bit version is recommended for improved stability. 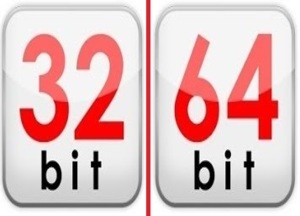 How to choose 32-bit and the 64-bit version for your system? The answer to this depends on your processor. The type of software version depends on the on the type of processor you have. For the two available versions of processors, i.e. 32-bit and 64-bit processors, the64-bit processor can run both 32 and 64-bit operating systems, however, a 32-bit processor can only run a 32-bit operating systems. Yes, it’s possible to have both versions installed at the same time.